For the armchair scientist, looking at histograms, scatter plots, and probability distributions is like trying to read Beowulf in Old English. You know it’s important and you desperately want to understand, but it isn’t easy. With challenges such as overfishing, ocean acidification, and sea level rise rapidly changing our marine environments, it’s more important than ever to help people understand—and care about—what’s going on. To this end, artists are working with scientific data and translating complex concepts and new findings into visually stimulating, thought-provoking works—similar to what director Robert Zemeckis did with his cinematic spin on Beowulf. The idea that art can be the catalyst to spur curiosity in science and promote greater awareness is gaining traction—some research and exploration vessels are taking on “artists-at-sea,” while academic and arts initiatives are pairing the right-brained with the left-brained for cross-pollination. When Philadelphia-based artist Rebecca Rutstein was aboard the exploration vessel Nautilus last year, expedition leader Robert Ballard made an apt analogy she won’t soon forget: exploring the deep ocean is like standing on the edge of the Grand Canyon in the dark. The artist can turn the light on. “I see art making the invisible visible and communicating scientific ideas in a visceral way that can reach a broader audience,” says Rutstein, adding that her data-driven work seeks to evoke wonder and excitement about ocean exploration. Here are five artists who are turning on lights, helping us look at scientific data differently. To create 1.26 and a second tsunami-inspired series entitled 1.8 (the number of microseconds by which the day was shortened after the 2011 Tōhoku earthquake), Echelman’s studio used data from the US National Oceanic and Atmospheric Administration (NOAA) to generate 3D models of the tsunamis’ amplitude rippling across the ocean. These renderings became the basis for the layered textile forms, which are modified to fit the location. 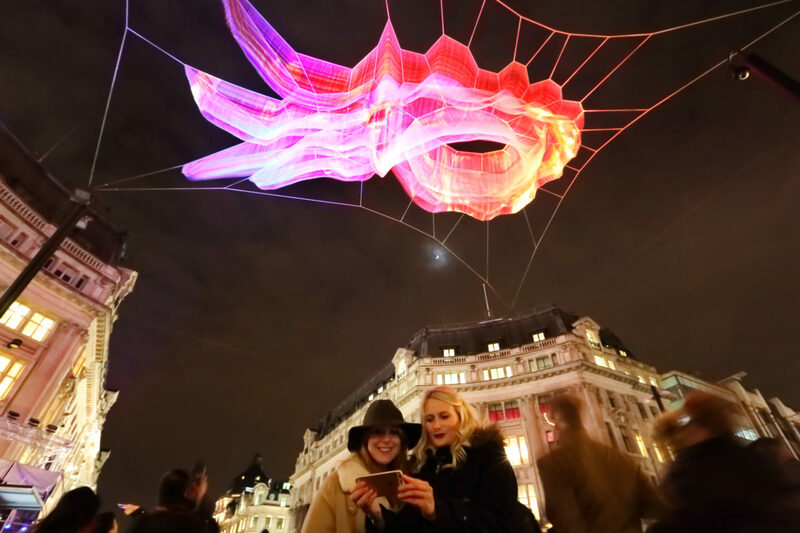 1.26 has been exhibited in seven countries, while 1.8 London has transformed the skyscape above Oxford Circus and 1.8 Renwick has literally floored visitors to the Smithsonian’s Renwick Gallery, who reclined on the carpet (also designed by Echelman and inspired by topographic data on the seafloor) to get the best vantage point. After the data was collected, Rutstein retreated to her makeshift studio in the vessel’s wet lab, where she used 3D visualization software to “fly” through maps of submarine landscapes and select interesting viewpoints to incorporate into her acrylic paintings. After pouring paint to create gemstone-like backgrounds, she projected the topographic maps onto her canvases and traced the lines in acrylics. The resulting pieces invite viewers to imagine the landscapes that lie beneath the sea. “Artists and scientists share a desire to make sense of the world around them, but they do so from different perspectives,” says Rutstein, who recently returned from a second artist-at-sea residency, this time aboard the Schmidt Ocean Institute’s research vessel Falkor. “The artist aims to communicate ideas visually, seeking out creativity and innovation, and ultimately thinking about the viewer.” It’s an approach, Rutstein says, that can help scientists make their ideas and findings more accessible to the public. After seeing firsthand the devastating effects of climate change on glaciers in Washington State last summer, artist and scientist Jill Pelto felt a profound sense of sadness. She has been visiting the area since she was a child, and for several years has been a field assistant with the North Cascade Glacier Climate Project (which her father, glaciologist Mauri Pelto, directs). She knew the science community would pay attention to the news that the glaciers suffered their biggest loss of volume in a half-century, but she wanted to get more people to care. “The data was just so dramatic and so astounding, I wanted people to see it visually,” says Pelto. So she grabbed her watercolors and transformed a graph showing a steep decline in what’s known as the glacier’s “mass balance”—total snow accumulation minus total snow loss—into a painting of a beleaguered mountain. For the past decade, Miebach has been using her own data as well as that of agencies such as NOAA and the US Naval Observatory to create structures that tell the stories of extreme weather events, climate change, and shifting marine ecosystems. After collecting data, Miebach plots it on a reed basket, which acts as a 3D grid, and adds markers such as beads and dowels to represent key data points. She also explores the economic, social, and political impacts of the storms and integrates her findings into her work. The artist’s Sandy Rides series, for example, features pieces that resemble the New York and New Jersey shorefront amusement park rides that took a beating during 2012’s Hurricane Sandy. In addition to making dozens of sculptures—from creations the size of a table centerpiece to 10-meter-wide wall installations—Miebach has worked with musicians and composers to translate weather data into musical scores. Classical and contemporary musicians alike have performed the arrangements, which can also be read off the accompanying sculptures. You’ve never heard—or seen—a storm quite like it. When a tsunami struck Japan on March 11, 2011, David Bowen’s kinetic sculpture tele-present water—which uses real-time NOAA buoy data to re-create ocean waves—started heaving up and down inside the Esther Klein Gallery in Philadelphia. “I don’t know if it was data from the tsunami or if the system just got overwhelmed, but it was a disturbing and fascinating thing that happened to the piece,” Bowen says from Scientific Delirium Madness, a California residency that brings together artists and scientists. Raina Delisle is a writer, editor, and digital journalist who has been published in the Globe and Mail, the Huffington Post, and Today’s Parent, among others. 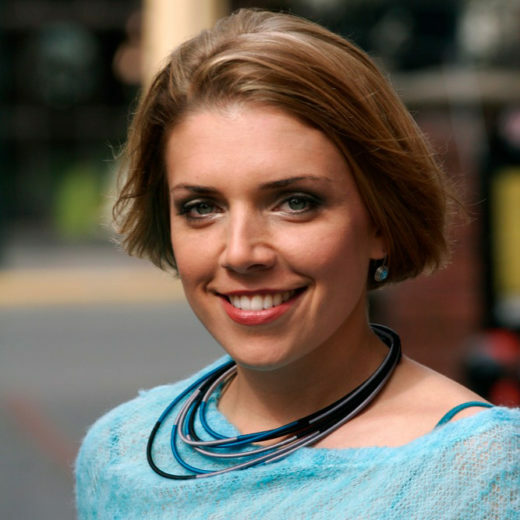 A former broadcast news producer and newspaper reporter and editor, she has covered a wide range of topics and today focuses her work on coastal culture, environmental issues, and the arts. She lives in Victoria, British Columbia, and enjoys hiking, camping, and building sandcastles with her family. Cite this Article: Raina Delisle “Amplifying Data Through Art,” Hakai Magazine, Aug 22, 2016, accessed April 26th, 2019, https://www.hakaimagazine.com/article-short/amplifying-data-through-art/. Profiles of five artists who find creative inspiration in beach debris.